Blue crystal glass cleaner is multipurpose superior glass cleaner and hard surface cleaner formulated to remove a wide range of general soiling and sugar residue from glass, mirrors, tiles, windscreens, visors, machine guards, Perspex, UPVC windows, frames, worktops, vinyl, chrome, gloss painted wood and stainless. 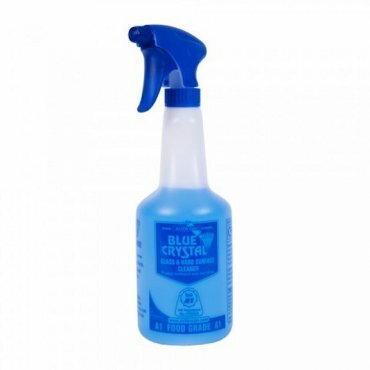 Blue crystal glass cleaner gives superb results without leaving any smears, streaks or grime on surfaces. Particularly developed for use in the food industry, the product holds A1 approval from InS for use in all food handling, manufacture and storage locations. Packed in a large 750ml fill trigger pack with locking spray nozzle.